MONTREAL - The NDP reached for modern and moderate symbols at its policy convention Friday, showcasing an American economist, a high-flying entrepreneur and the party's social-media know-how. A showcase of leader Tom Mulcair capped off the day, all part of a concerted move by the party brass and caucus to prepare the NDP for the 2015 election. A video explored Mulcair's life as a father, husband, brother in a family of 10, and as a politician. In front of a sedate crowd of delegates, he took a series of pre-selected questions on a range of policy issues. "We're going to have a message of hope and optimism for Canadians. We're going to transmit that across the country, but we're going to work it out so that every single riding receives the same message," Mulcair said of the next election. "We're going to work together, we're going to consult, and we're going to come up with the best candidates to complete the team of women and men that already comprises our caucus in Ottawa." But the party's far-left wing is showing signs it won't go down without a fight, arguing for the NDP to stick to principles over electability. They wore pins and handed out flyers in the crowd of nearly 2,000 inside the cavernous Palais de Congres. The day opened with a keynote address by Nobel Prize winning economist, Joseph Stiglitz, one of two speakers this weekend connected to Democratic politics in the United States — usually a party regarded as a cousin to the Liberals. Stiglitz told The Canadian Press in an interview that the NDP is in a good position to avoid the mistakes of other social democratic parties as it considers taking a more moderate path toward the next election. "One of the advantages you might say of coming late to that is you can see what worked and what didn't," said Stiglitz, The former adviser to president Bill Clinton. "I would just say, don't be doctrinaire. Don't do what Labour did in the U.K. and say we have to privatize everything ... if you have a good enterprise that's national, and it's working, it doesn't make a lot of sense to privatize it. If you have something that's not working, one has to think about how to reform it." 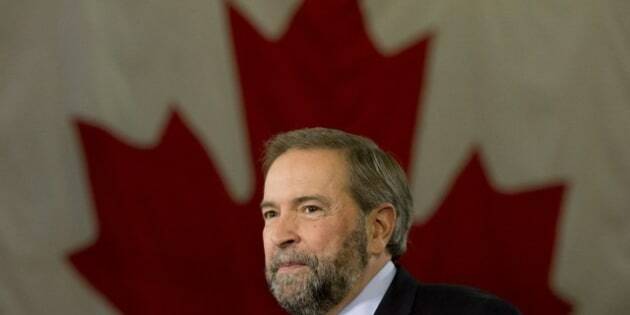 The message fit with NDP Leader Tom Mulcair's vision for the party, which is more friendly to business and trade than the party has been in the past, but is still strongly interventionist. The group also heard from Quebec-born businesswoman and philanthropist Ruma Bose, who has filled executive-level positions at a number of firms. Jennifer Hollett, a television personality, served as the social media master of ceremonies. It was the unscheduled, unproduced parts of the convention that revealed points of division. The rank-and-file began closed-door discussions on a reworked preamble to their party's constitution, one that is more moderate, and removes most references to socialism. One line talks of the belief in a "rules-based economy" to address the "common good." "It's 50 years old. Language changes over the years. I don't think we should be hung-up on language," said Ontario NDP MP Charlie Angus. "It's about who we are today and how we speak to a new generation of Canadians and how we spoke to a previous generation of Canadians that used a different language. We're just going with language that makes sense to people and people understand." In the late afternoon, about three dozen members of the so-called "socialist caucus" met to discuss their concerns with the attempted changes to the party. NDP MP Niki Ashton spoke to the group briefly, saying she too had concerns with changes to the party's core principles. The NDP rank and file, the grassroots, the delegates should resist the move to make the NDP replicate the Liberal party. We don't need two Liberal parties," said Barry Weisleder, one of the members of the left-wing of the party. "We think the NDP can and should do better, and electoral opportunism is no substitute for concrete problem solving, let alone conscience." But apart from a brief skirmish on the floor of the convention regarding whether or not to let a Democratic Party field director to speak on Saturday, other resolutions passed without much fuss. The party voted to more directly support supply management and passenger rail service, and register its opposition to tax havens. Delegate Elizabeth Grew of Belleville, Ont. said the focus on the party's constitutional language and resolutions isn't that important to her. "It's more of a Conservative party issue than it is a New Democratic Party issue of this continuous attack on anything that is not individualistic, capitalistic in a very self-centred way," said Grew.